I haven’t been paying much attention to the protests in New York City and elsewhere (though that will change if they began to interfere with my commute). Indeed, I’m very sympathetic to their outrage about corrupt bailouts and crony capitalism. But these people don’t draw the right conclusions. They complain about the problems caused by government, yet they generally think the solution is…you guessed it…even more government. Obviously, they are not familiar with Mitchell’s Law. But this post is not for serious discussion. Instead, here are two humorous attachments about the protests. 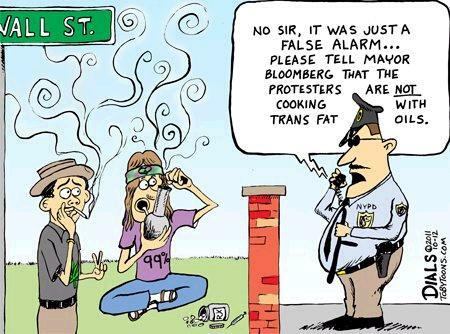 I like the first one because it mocks Mayor Bloomberg’s nanny-state policies. And I like this image because it makes fun of those who think they should never be responsible for the consequences of their own choices. I have no idea whether this is the real life story of a real person, but it has that snarky sense of humor that I enjoy. But if you’re a regular reader, you know that already. The guy with the bong is doing it exactly backwards – sucking on the bowl while trying to light the mouth end. am i the only one frustrated by the guy smoking that bong incorrectly? It is people’s desire to subdue economic activity to collective management that creates crony capitalism. Further subordination of the economy to collective management is more of the same unearned-wealth ever slower growth poison. Semi-regulated markets are much worse than people think. The distortions of the regulation give rise to great politically protected opportunities for unearned wealth, yet the regulation is not complete to prevent such unscrupulous incentives — people, especially smart people will always find ways to take advantage of the distortion/regulation. The two ways out of it are: (a) Removal of the communal management distortions so that smart people truly compete with each other or (b) complete subordination to communal regulation which may be a stable, alas, a 0.5% growth environment to economic oblivion. Any guesses as to which solution the Occupiers are promoting? What has emerged from the movement’s rejection of representative democracy (denounced in Real Democracy NOW! http://en.wikipedia.org/wiki/Democracia_Real_Ya manifesto as having klepto-plutarchratic tendencies) appears to be a form of grassroots participatory democracy based on people’s assemblies and consensus decision making. These horizontally structured assemblies are completely transparent and open to anyone who wants to participate. According to statistics published by RTVE, the Spanish public broadcasting company, between 6.5 and 8 million Spaniards have participated in these protests. More than 6 million Spaniards! Wow! THAT IS AN ENORMOUS MOVEMENT AGAINST THE POLITICAL CLASS POWER!!! And it is clear that it is an INTERNATIONAL movement! A lot of the protesters are underemployed youth. IMO Europe’s horrific high taxes on labor often send the unskilled to unemployment, only the more skilled are productive enough to be able to pay those taxes. I think this movement is actually a TSUNAMI that hits the political class. With the Internet and the cellular internet technology through blogs like this one people can finally see the truth that mainstream media never showed. And the truth is that reducing the political class power is the most urgent task that Mankind has. Very funny. 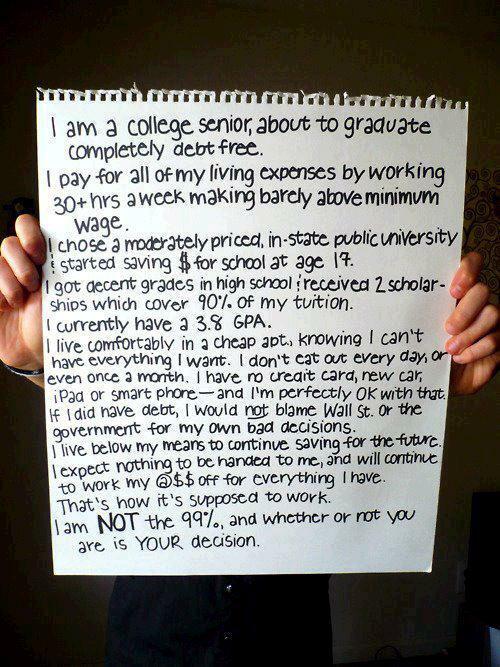 There are some good points about the OWS but most of what I’ve heard isn’t it. Yes, Dan, the 2nd photo is a true story; I have a friend who’s a friend of the individual who wrote that paper and who’s in the picture, and everything is absolutely 100% true. Those are great!!! I wonder how Mayor Giuliani would have handled it. But I can guarantee OWS wouldn’t have liked it! Like the cartoon. Thanks for sharing!